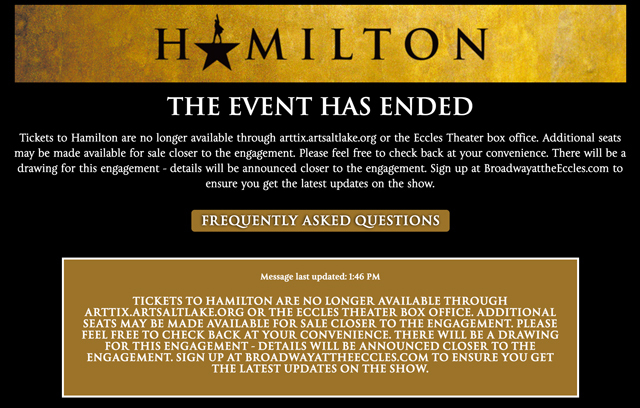 Hamilton is coming to Salt Lake City. No Lin-Manuel Miranda, but still exciting. So I tried to get tickets today and ended up coming up empty. Some friends I know got tickets, so I was hopeful. But alas, nothing. The run is from April 11, 2018 through May 6, 2018. Mondays are dark. That’s a lot of performances, with two on most of the Saturday and Sunday days. 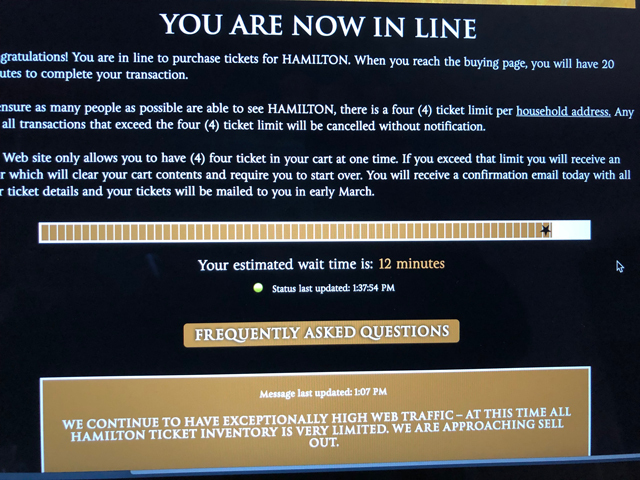 Here’s the series of camera pictures I took [didn’t want to chance accidentally closing the browser window to lose my place in line] of the process I went through to NOT get any Hamilton tickets. I got in the queue well before the 10am on sale time. I believe it was 8:52am MST. 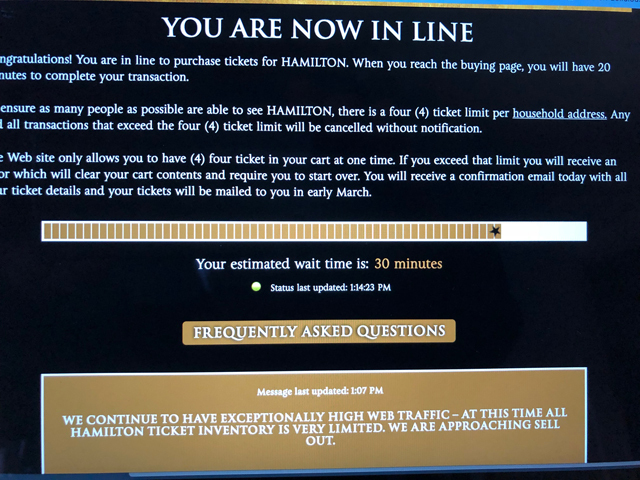 After almost 3.5 hrs of being online, I was still more than an hour before I could get tickets. 17 minutes. This gave me hope. It would be false hope. 12 minutes. 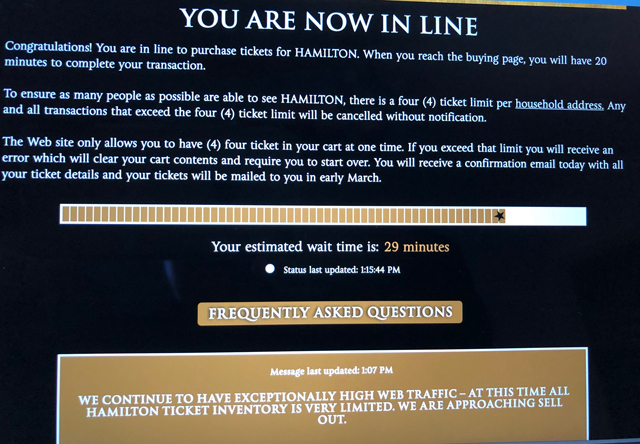 You can see the updated message that ticket inventory is very limited. Hope diminishing fast at this point, but 12 mins was still a possibility. And at 1:46pm MST, no more tickets. The only legit option for tickets is the before show lottery. You physically go to the theater, get in line 2 hours before and hope you get picked. If you do, tickets are $10 (a Hamilton). 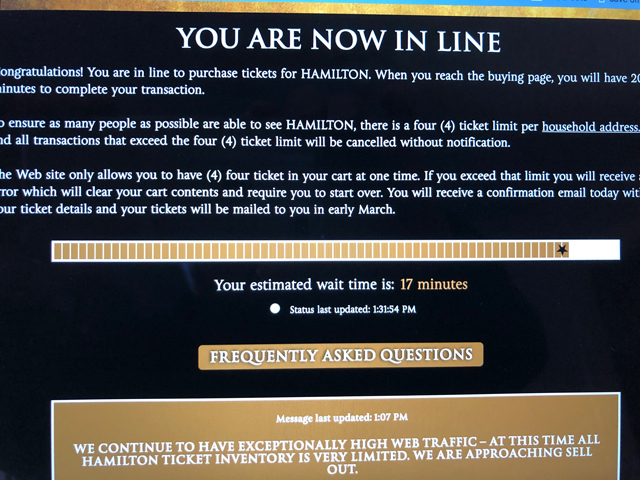 So I might do that on days that I have some time to go wait in line. We shall see. I don’t want to go to a scalper. Too much money and I hate giving them my money. Might have to wait for another run in 2019. 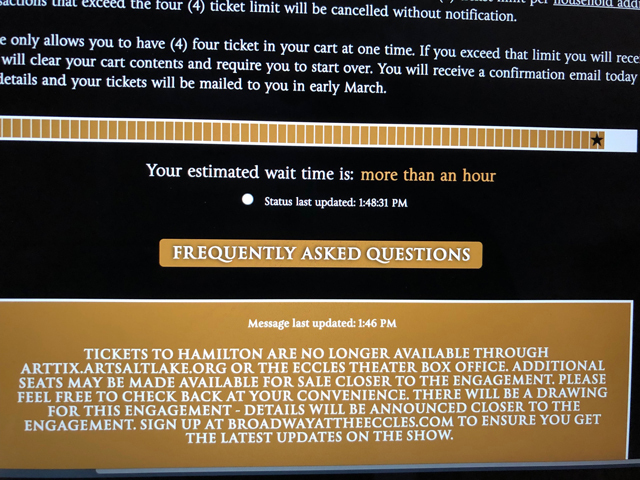 The Book Of Mormon play was pretty high in demand it’s first time in Salt Lake City. The second run was much easier to get tickets. 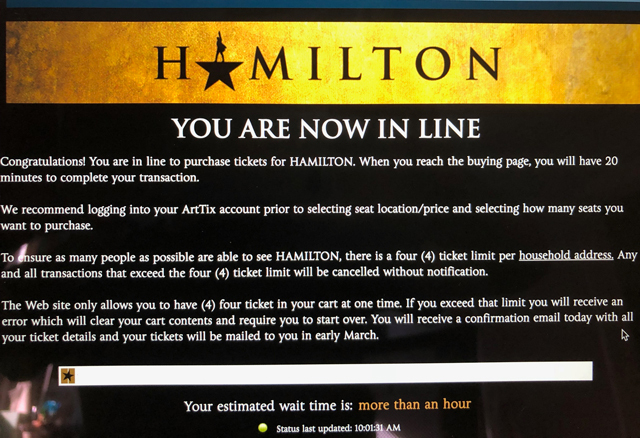 I’d love to see Hamilton but it’s just so ridiculously expensive and overrun by ticket harvesters that I don’t bother. Yeah, the price of the tickets was insane. These SLC shows started at $75 before fees (which were about $6 per ticket, so lower than most other ticket agencies). Crossing my fingers for you. It came to Phoenix but tickets were super expensive and I snoozed and lost anyway. Yeah, the prices were $75 to $225 per ticket. Hard to pay that, but obviously, many did here. 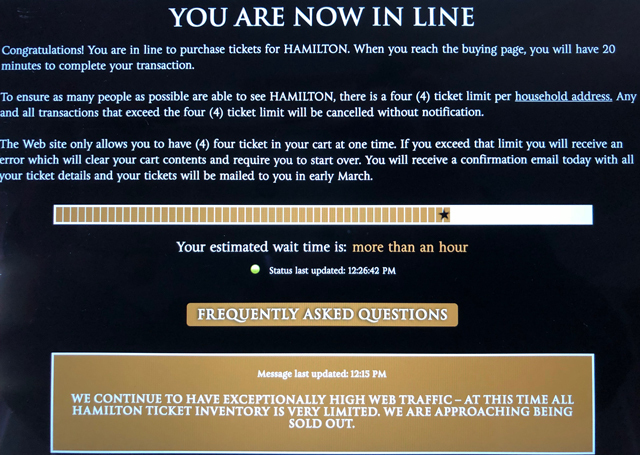 If I can’t get the standby $10 tickets for the night of the show, I may have to wait for the next time it comes around.